Back in May, we heard that Cliqset founder Darren Bounds was working on a stealthy new social project called Glow. Cliqset, a FriendFeed like social aggregation platform, shut its doors last Fall. Today, Bounds is revealing his newest startup (not called Glow)—Path.To. 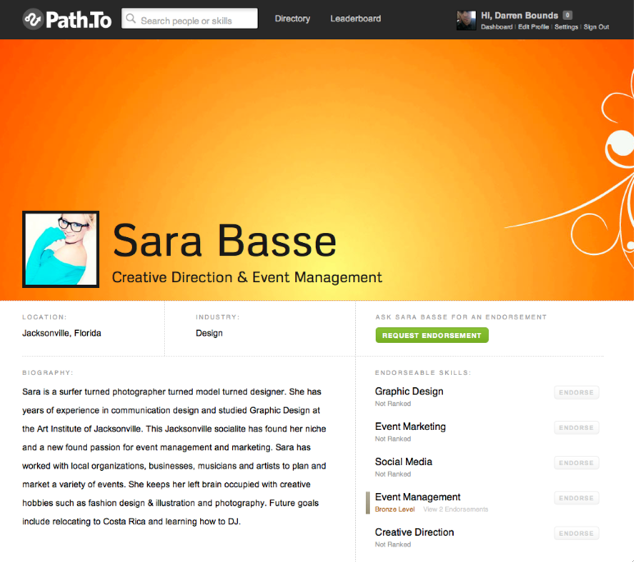 On your profile, you can import information from Facebook and other sites, and list your skills and experience. Similar to the way your can recommend connections on LinkedIn, Path.To allows users to ‘endorse’ fellow connections by skill. Path.To also provides ‘leaderboards’ which rank people by how many endorsements they have. You can search for professionals by skill, name, or industry and access analytics about your profile. Bounds tells is that there’s a lot of noise on LinkedIn that takes away from the professional profile. Path.To aims to help users stand out, he says, connect with each other, and create a place on the web where employers can access professional skills and experience. Bounds explains that Path.to ‘trims the fat’ away from LinkedIn. It’s certainly ambitious for Path.To to take on LinkedIn’s massive userbase, but it should be interesting to see if LinkedIn users feel the need to expand to another platform for endorsements.